Once again, the folks at Boom! 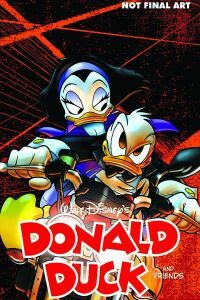 Kids take things in a whole new direction… Donald Duck and Friends Volume 1: Double Duck is a new trade paperback (also available in hardcover) that collects the recent issues of this comic book series… featuring everyone’s favorite cranky duck as a top-flight secret agent, out to save the world from a madman bent on melting the world’s polar ice caps! The story is by Fausto Vitaliano and Marco Bosco, with various folks contributing the full-color art. The books are scheduled to come out in early May. c. 2010, Boom! Studios. Not the final art... but oooo!